Gaspare Bonelli first appears in the Painesville, Ohio, area in 1913. In America, Gaspare Bonelli was known as Jasper Bonelli. Gaspare Bonelli, son of Antonio Bonelli and Rosa Bellavia, was born on December 1, 1889, at Licata, Sicily. He married Frances M. Tabone in 1923. Gaspare died on July 28, 1959, at Lake County Memorial Hospital, Painesville, Lake County, Ohio, at age 69, of a heart attack. His body was interred at Riverside Cemetery at Painesville, Lake County, Ohio. Gaspare Bonelli immigrated to the United States on December 4, 1912, at age 23, travelling to Cleveland, Cuyahoga County, Ohio. He was joining his brother, Vincenzo, in Cleveland. Gaspare Bonelli became a citizen of the United States on August 27, 1943. Gaspare resided at 412 Railroad Street, Painesville, Lake County, Ohio, when he was naturalized. At the time of death, Gaspare resided at 412 Railroad Street, Painesville, Lake County, Ohio. Gaspare Bonelli had two brothers also living in Painesville, Vincenzo and Epifanio. 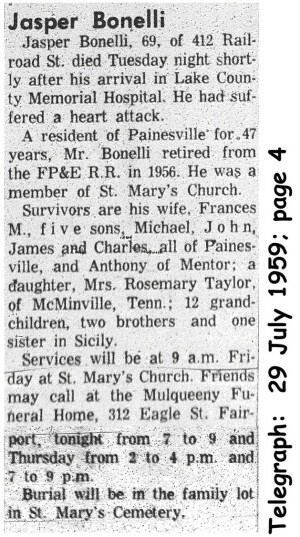 Gaspare Bonelli retired from the FP&E Railroad in 1956. 1. Anthony Bonelli was born about 1925, at Ohio. Antony died on April 26, 1987, at Andover, Ashtabula County, Ohio. 2. Michael C. Bonelli was born on August 8, 1925, at Ohio. 3. John C. Bonelli was born on November 20, 1927, at Painesville, Lake County, Ohio. He married first, Dorothy Leininger, daughter of Charles E. Leininger and Cora Lee Cora Lee Rhodes, on December 13, 1952, at Lake County, Ohio. John was divorced from Dororthy on April 6, 1954, at Lake County, Ohio. 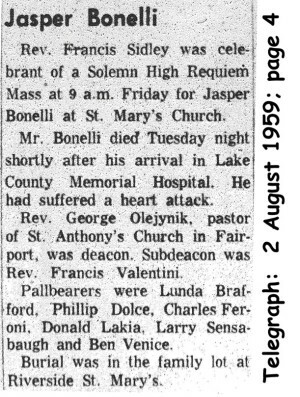 He married second, Virginia Brasachio, daughter of Giovanni Battista Brasacchio and Francesca DeBiase, on May 7, 1955, at St. Mary Catholic Church, Painesville, Lake County, Ohio. John died on November 10, 1999, at age 71. 4. Epifano Bonelli was born about 1928, at Ohio. 5. Rosemary Bonelli was born on October 29, 1928, at Painesville, Lake County, Ohio. Rosemary died on August 11, 2005, at LakeEast Hospital, Painesville, Lake County, Ohio, at age 76. 6. James Bonelli was born on March 1, 1936, at Painesville, Lake County, Ohio. James died on February 10, 2011, at his home, Painesville Township, Lake County, Ohio, at age 74. His body was interred at Western Reserve Memorial Gardens at Chester Township, Geauga County, Ohio.